Many renters feel buying a home is an impossible dream. But consider this: A landlord expects to make a profit after paying the mortgage, taxes, insurance, repairs and other expenses. His only income for the rental property is the rent paid by the occupants. As time goes on, and the value of the property increases, rents rise and his profit margin grows. If you want more control over your housing, and more importantly a share in the profits, buying is the choice for you. If you’d prefer to continue putting money in your landlords pocket and adding to his net worth, don’t make any changes and continue renting. Before you choose you may also wish to consider the following. The basic premise of renting: Someone buys a property whether it be a single family home or a 300 unit apartment complex. They find tenants, i.e. people to pay their mortgage for them ,and in return they allow those people to live there. You are always buying a house, when you are renting you are just buying it for someone else. Lets say that you are renting an apartment with two of your friends. All three of you pay the same amount each month for the right to live there but when you move out, what do you have to show for your time and money spent at the apartment? Answer: NOTHING! Now, lets say that you owned the house and rented rooms to those two friends of yours. Your roommates are paying at least 2/3 of the mortgage for you (it’s quite possible that they will actually be paying more) however, YOU get to deduct all of the mortgage interest and real estate taxes from your income taxes each year (in the first few years of your mortgage over 90% of the payment is interest)! So, by keeping those same roommates you were living with before and simply having them live in YOUR home, you can reduce your tax burden and save thousands of dollars each year while building equity in the home you are on the fast track to owning! The benefits of ownership don’t stop there! A home is an asset that appreciates, that is it increases in value over time. The rate at which a home appreciates is the result of factors such as it’s location, that is, the higher the demand for a home in a location such as a city or subdivision, the higher the rate of appreciation. Other factors include the cost of building supplies associated with the construction of a home and the general health of the economy in the city the home is located. Appreciation rates in Columbus tend to average around 3 to 4% (which means a $200K home is likely to appreciate $8,000 a year!). Furthermore, if you purchase your home with a mortgage, a home is what’s called a leveraged asset. That is, while you may only put a few thousands dollars down when purchasing the home, it appreciates based on it’s total value rather than the value of your down payment. For example, if you purchase your $200K home with a $5,000 down payment, your home (and thus your net worth) would increase in value by $8,000 ($200,000 x 1.04) rather than the $200 ($5,000 x 1.04) you would have earn on your down payment! Buying a home is one of the smartest decisions most people will ever make! But don’t take our word for it, take the Federal Reserve’s. It’s Survey of Consumer Finances has consistently found a huge gap between the wealth piled up by homeowners and that accumulated by renters. Home ownership builds wealth through the forced savings of paying down a mortgage, appreciation of the asset and the tax benefits the home provides. Inventory levels and the selection of homes available for sale has increased giving buyers more options to choose from! In addition, interest rates are still hovering around 40-year lows! Quite simply, now is a great time to buy a home! For those looking to buy their dream home with $600,000 or more to spend, there are lots of motivated sellers in this price point! Again, if you’re thinking of buying a home there has never been a better time to do so! Rates are low, inventory levels are on the rise, many sellers are anxious and prices are still well below the national average but continue to rebound. Think before you rent! Pick up the phone and begin the path to financial freedom! Still not sure? This calculator from the New York Times can help you determine if given your situation, Is it Better to Rent or Buy? 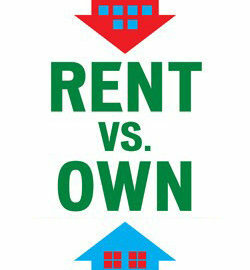 Here’s another Rent vs Buy Calculator from Lending Tree to determine if renting or buying makes better sense for you.